For months now, behind the scenes, David and I have discussed just how powerful questions can be. Sometimes it’s not what you know, but what you ask that makes the most powerful point. For his Heartland presentation last Friday, David delivered a themed compilation of example after example of the Western Climate Establishment allowing mistakes, errors or biases to accumulate — each factor on it’s own might be hard to pin down, but the sum total of actions (and inactions) forms a wholly consistent pattern. This is Part I. These photos speak for themselves, but as far as I know, they haven’t been assembled in one web page before and David stopped waiting for me to get the time to annotate them and has helpfully used red arrows so even the less technically minded will “get” the implications. NOAA is a $4 billion dollar agency. If they were determined to get the most accurate, reliable measurements possible would they leave so many sensors placed near asphalt, concrete, tarmacs, exhaust vents and fermenting vats of sludge? If the mainstream media will print Brittney’s tattoo, why don’t they have space to print full color photos showing just how we measure the temperatures that billions of dollars of legislation depends on? [The first in a series of articles reviewing the western climate establishment and the media. Why Do They Measure Temperature Like This? 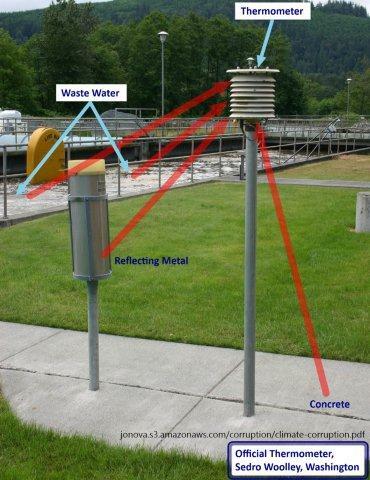 Figure 1: An official thermometer at a waste water treatment plant. 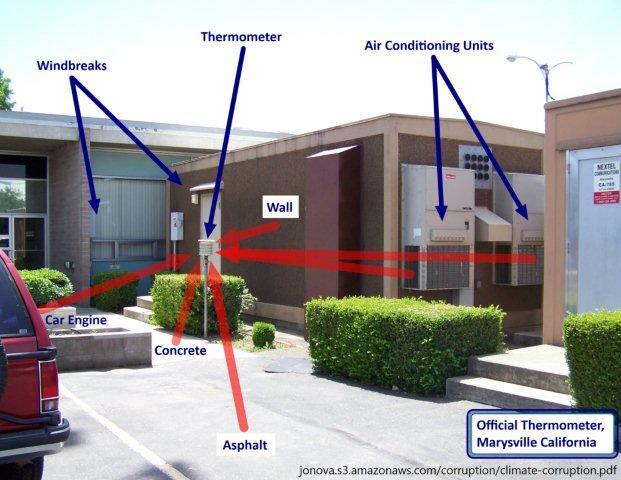 It gets extra warming from air conditioning and refrigeration exhaust, concrete, a brick wall, and some mechanical equipment. It is protected by windbreaks. 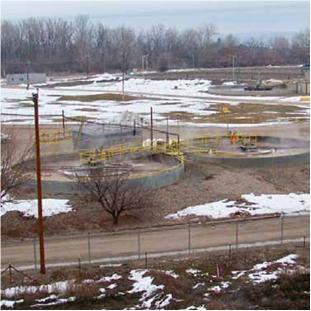 In addition, the effluent flowing under the grates is well above freezing in winter when vapor can be seen rising from the grates. (The red lines show possible heat paths; obviously only a small portion of the heat from each source gets to the thermometer.) Photo courtesy of Anthony Watts, www.surfacestations.org and Steve Tiemeier. 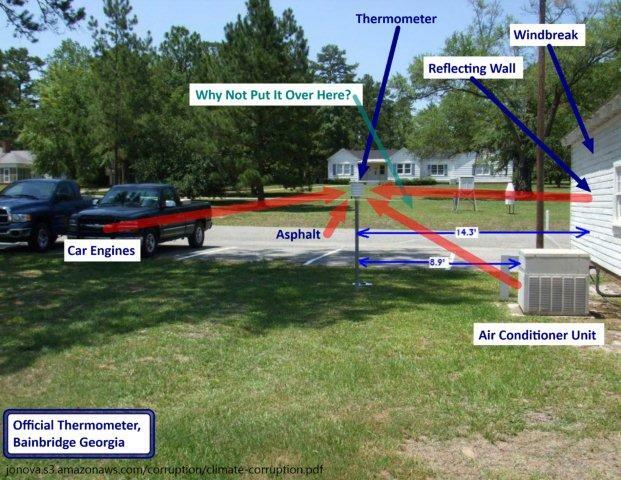 Figure 2: There is a better site on the grass just across the car park, so why is the thermometer near the air conditioner, car engines, asphalt, and reflecting windbreak? Photo courtesy of Anthony Watts, www.surfacestations.org and Joel McDade. Global warming is measured in tenths of a degree per century, so any slight artificial nudge to the thermometer is important. To avoid such nudges, the official siting requirements say that the thermometer must be at least 100 feet (30 meters) from any paved or concrete surface, in a level open clearing, with ground cover typical of the region. That is, in a natural and typical clearing. Anthony Watts , a 25-year broadcast meteorology veteran, recruited 650 volunteers to inspect and document the 1,221 land-based thermometers overseen by the National Oceanic and Atmospheric Administration (NOAA) in the USA. Of the 860 thermometers inspected by early 2009, 89% fail to meet the official siting requirements because they are too close to an artificial source of heat (including artificial sources of reflected or radiated heat). Why does the climate establishment persist in measuring the official temperature record from thermometers that are nearly all too close to artificial sources of heat? Why have we only found out about it because volunteers went out and photographed the official thermometers? Money can hardly have been the problem: NOAA’s budget is now over $4 billion per year. Over 2001 – 2008 NOAA finally took some steps to fix the problem, setting up a new network of 114 properly-sited thermometers that “50 years from now can with the highest degree of confidence answer the question: How has the climate of the nation changed over the past 50 years?”. However the old network still provides the official temperatures. NOAA have stopped using a handful of the poorly-sited thermometers whose photos have been circulating around the Internet. But the temperature data from those thermometers is still in the official temperature records. Figure 3: The thermometer at Marysville California . 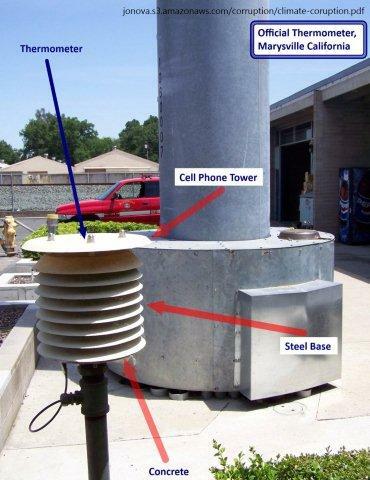 Extra warming from car engines in the parking bays, air conditioner exhaust, asphalt, concrete, a wall, wind breaks, and (see Figure 4) reflections from a steel cell phone tower. They stopped using this thermometer for official data in 2007, after photos of it first appeared on the Internet. 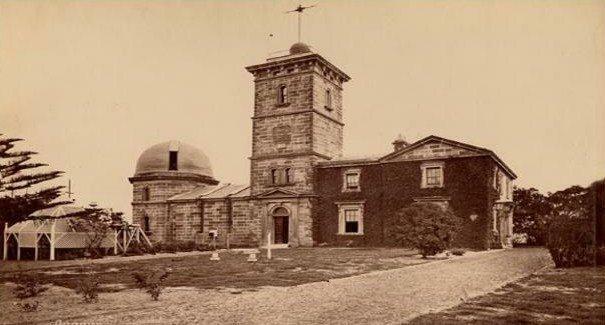 But the data collected by this station (back to 1897) is still in the official record. Photo courtesy of Anthony Watts and www.surfacestations.org. Figure 6: This official thermometer is warmed by the decomposing organic matter in the waste water (the previous figure, of different tanks, shows that waste water is warmer than its surroundings). Photo courtesy of Anthony Watts, www.surfacestations.org and Don and Liz Healy. 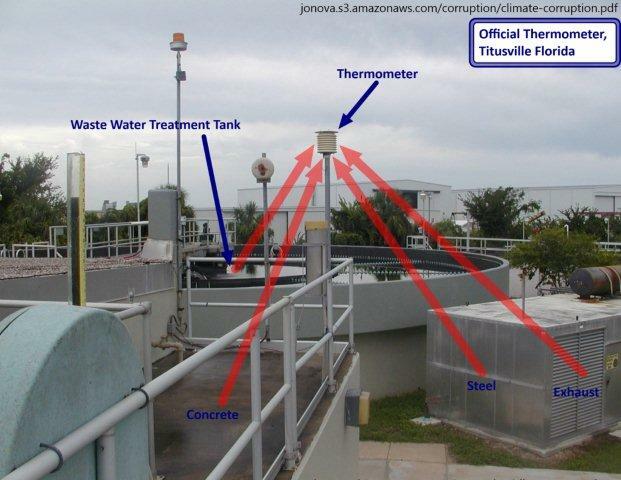 Figure 7: This official thermometer gets warming from nearby waste water, machinery, and metal and concrete surfaces. 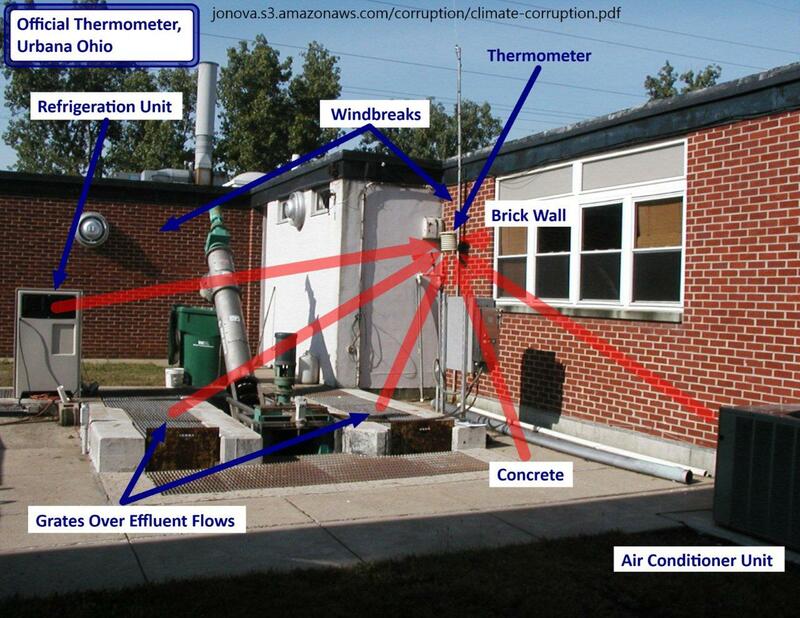 (There is also another waste water treatment tank behind the camera, and an air conditioning outlet at ground level just below and to the left of the thermometer, out of view.) Not exactly a level open clearing, with ground cover typical of the region, as per the official siting requirements. Photo courtesy of Anthony Watts, www.surfacestations.org and Don Kostuch. Why hasn’t the mainstream media published any of these photographs? All it takes is to send a reporter or television crew. The thermometers are generally in public places, and their locations are available from the NOAA website. Everyone understands that it’s cheating to put a thermometer near an artificial heat source and pretend that it shows the temperature of the local area. Is the mainstream media failing to do their job and covering up for the climate establishment? Is real debate even allowed in the media? The issue of thermometer location is substantive and highly relevant to the existence and rate of global warming, but has never been discussed in the mainstream media. 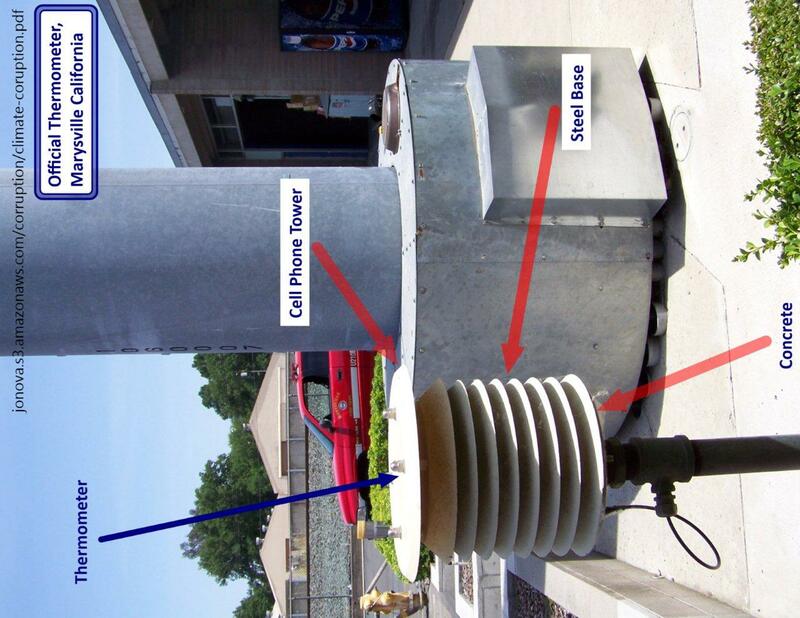 Figure 8: This thermometer gets warming from the roof surface, which reflects and radiates heat, and from a nearby air conditioner outlet. (Couldn’t they at least move the thermometer further away from the a/c?) The urban landscape, with its heat-emitting cars, offices, home, etc., and many radiating surfaces, provided increased heat as Baltimore grew. Spot the “ level open clearing, with ground cover typical of the region”. Photo courtesy of Anthony Watts and www.surfacestations.org. Land-based thermometers are frequently compromised by the urban heat island effect. The microclimate around a land-based thermometer can change due to urban encroachment, such as nearby asphalt, concrete, buildings, air conditioners, cars, electrical appliances, or changes in vegetation. The annual mean air temperature of a city with 1 million people can be 1–3°C warmer than its surroundings. In the evening, the difference can be as high as 12°C. 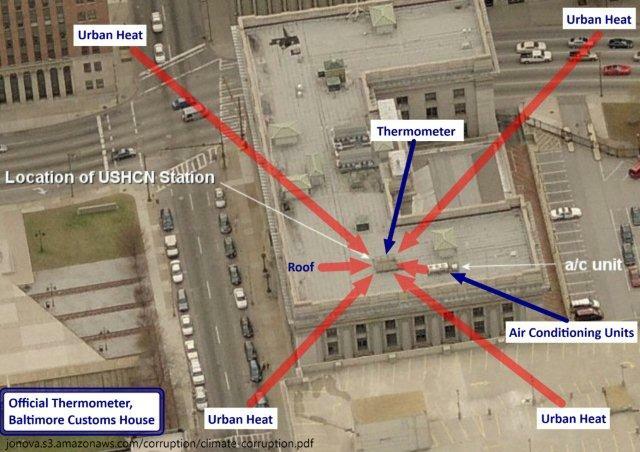 These thermometers measure urban growth and increased use of air conditioners, cars, waste-water plants, etc… Why do the climate establishment represent their temperatures to the public as “global warming”? The global network of land-based thermometers has 1,079 official thermometers , at least 54% of which are at airports. 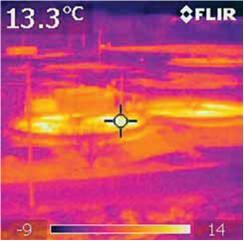 Airports have lots of tarmac, which radiates heat at night and thereby raises the temperature recorded at the airport. At many airports, thermometers also get occasional warming blasts from jet aircraft. More than 80% of thermometers in the official global network are in urban areas or at airports, which are both unnaturally warm localities. Take a look out the window when you fly—the vast bulk of the land is not at an airport or in an urban area. Isn’t the climate establishment measuring urban warming and airport warming rather than global warming? They have placed their thermometers to measure the growth and use of cities, air conditioners, planes, water treatment plants, cars, buses, trucks, asphalt, concrete, and tarmac. They measure temperature in many of the globe’s warmest localities, but not global temperature. Yet they report those temperatures as “global warming”. How have they been able to get away with this? Where are the auditors or the regulators to check on the climate establishment? If a financial organization or drug company tried to pull this kind of deception they would get busted. Full PDF versions for printing and emailing are available from the summary page. If you are looking for heat, wouldn’t you place the thermometer near the source of heat? The problem is that politics is intrinsically corrupt and that climate science has been subverted by far left politics. Those of us on the outside of the Marxist bubble surely see this as horribly corrupt. Politicians only recognize the corruption of their opponents and rationalize their own corruption as a means to an ends. The danger comes when scientists promoting sloppy and faulty science latch on to corrupt politicians whose agendas are supported by the bad science. This creates a feedback loop reinforcing the bad science. Feedback reinforced warming is not the problem, bad science reinforced by political feedback is the real problem. I don’t know how you could demonstrate more graphically the inaccuracy of the global temperature records. Unfortunately as you know NOAA and other agencies claim temperature records are ‘adjusted’ to take into account site variances and the heat island effect. That explanation is unquestioningly accepted by main stream media and a mainly uncritical scientific community. I’m at a loss to understand why this is the case! Clearly, there is a monumental fraud going on. We, the taxpayers are paying billions for the creation of the weather/climate data. The data is cooked (literally and figuratively) at every step of its generation. It may start out reflecting what is happening at the points of measurement but it can in no way be integrated to be a valid measure of global climate. They have numbers only and the numbers are no better than would come out of a random number generator. “They” keep saying they have a massive amount of evidence. Yet every time the quality of the evidence is examined it comes up grossly short of the quality necessary to justify even their minor claims. Let alone their demands that, if met, will destroy technological civilization and the bulk of mankind with it. We are not going to change them or their “beliefs”. They must be neutralized and their power to make laws eliminated. We must act in such a way so as to make them and their “beliefs” irrelevant. Its either them or us. There is no middle ground! Just as there is no middle ground between good food and poison. Compromise with poison and you get sick and die. Compromise with them and you will get the same result. So the point is that no one can say with any certainty whether we are warming, cooling or staying the same. If someone asks me whether I believe in global warming (anthropogenic or natural) I just have to shrug. Who can say? The measurement of temperature is totally bogus. Yeah right, & on top of this you get the impression the data homogenization generally appears to be upward in the recent data. Handy if you are spruiking commodities ( or an argument ). Has Ken Stewart or anybody in Australia developed an understanding of the methods & logic behind the BoM’s homogenization techniques? But, but, but Jo. Gatekeeper Phil Jones and gatekeeper Tom Karl insist that UHI has only a miniscule effect. If it’s in the peer reviewed literature it must be a fact. In a heart-rending twist Dr Derocher feels as the sub-Arctic and Arctic sea ice continues to disappear more and more polar bear populations around the world will turn to the foraging behaviour. But it will be a last ditch attempt to claw on to life. ‘Seeing them roaming grassy plains and trying to eke out an existence on measly food that cannot sustain them is the future of the polar bear,’ he said. I can say with absolute certainty that the climate is always changing. Over the last 15K years, the RMS value of change in the 10 year average temperature is about 0.8 C per century (according to DomeC ice core data). The max rate of change in this average exceeds 3.7C per century which makes the minor warming seen today, even if the fudged data was believed, nothing to be concerned about. The long term trend (multi-century averages) is definitely towards cooling and this is something to be concerned about. 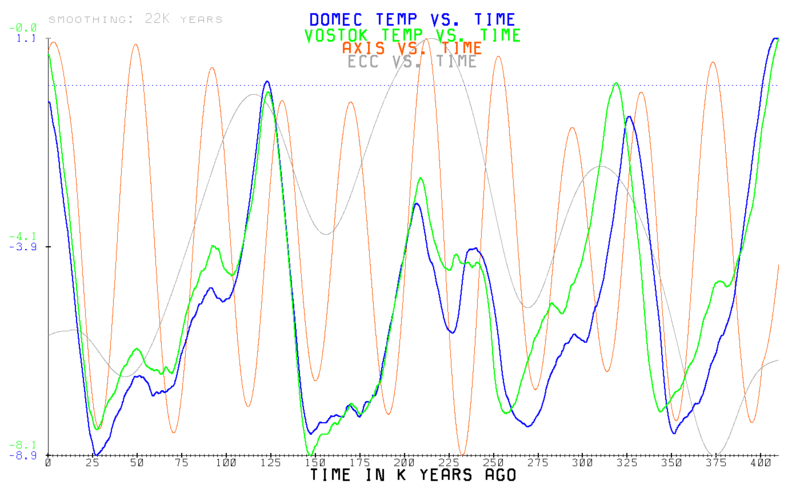 This shows the 22K year average Vostok and DomeC ice core temperature reconstructions superimposed with the axis variability and eccentricity. The correlation to min/max of the Earth’s axis variability is unambiguous. The eccentricity dependence is a little more subtle and depends less on the absolute eccentricity than it does on it’s rate of change. The effect of the seasonal alignment of perihelion also amplifies or attenuates the effect, but is removed from the above plot by applying 22K year averaging. 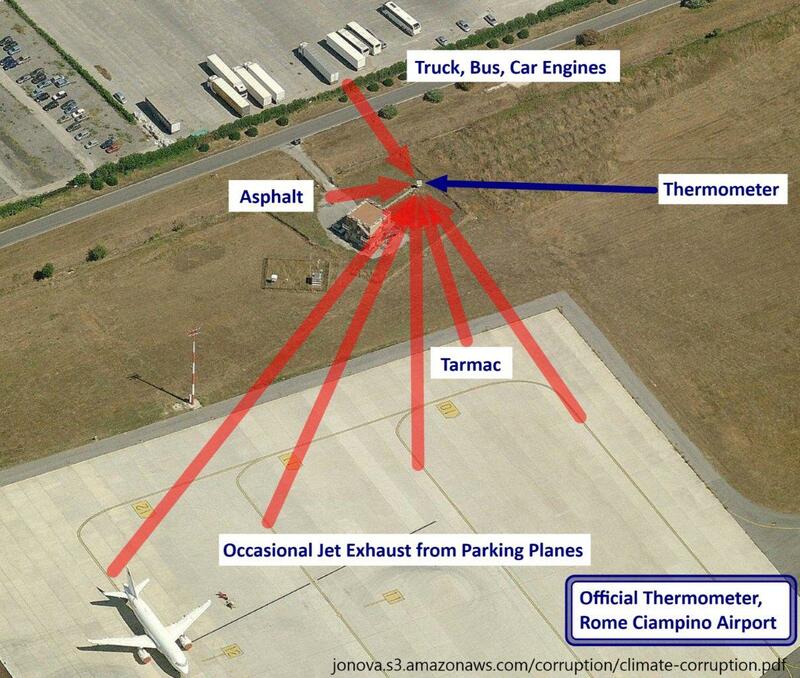 Modern aircraft operations require accurate information regarding temperatures over airport runways, so the calibration and siting of these thermometers would have been designed for that purpose. What is wrong, is including them in the global temperature data set. That is not what they are designed for. 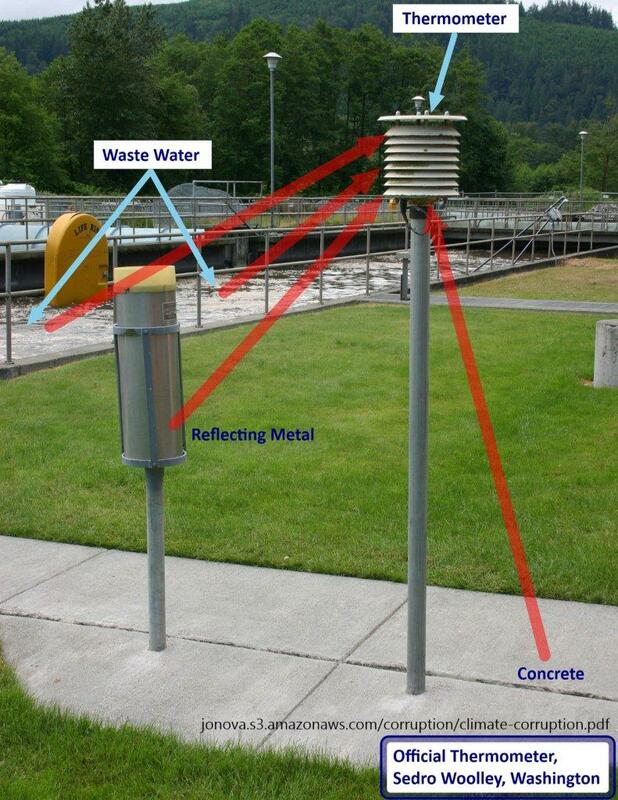 The reason many of NOAA’s weather stations are at airports. The temperature of air over hot concrete runways is important and used by pilots to calculate whether the air is dense enough for liftoff. 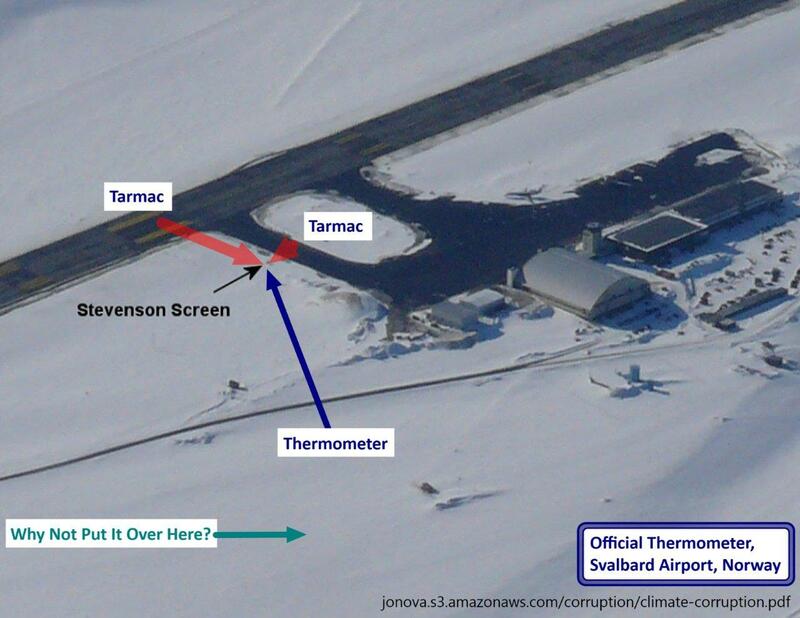 Are the data sets from Airports accurate as an indicator of temperature shift globally; NO, they serve a different purpose. 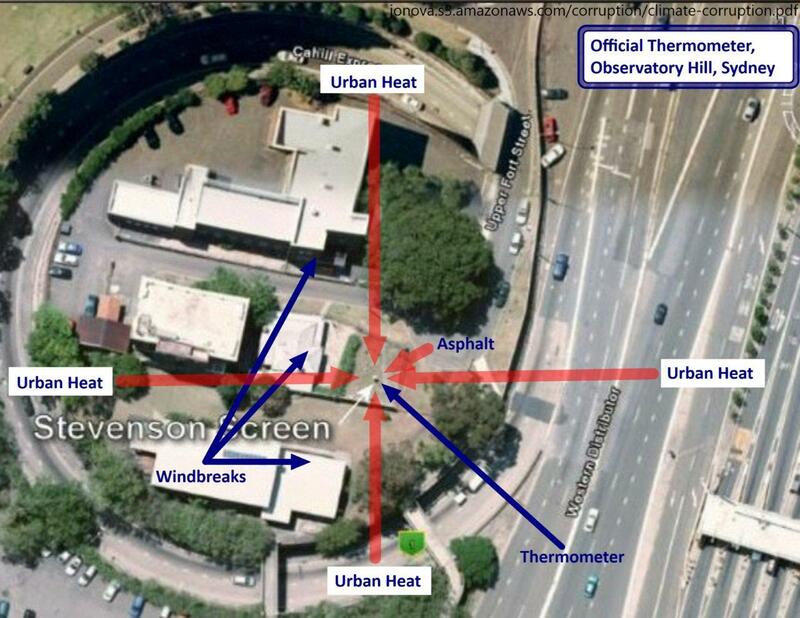 These [Urbanised] thermometers measure urban growth and increased use of air conditioners, cars, waste-water plants, etc… Why do the climate establishment represent their temperatures to the public as “global warming”? Duh … because, if the temperatures go up, something must be getting warmer … hello? The intentions of the climate movement are very clear. They need to protect the planet and to do that, they need to make the world cooler, so they need to lower the average global temperatures. To do that, they need to remove all of the urban influences on thermometers. This can best be achieved by destroying civilisation. <– smiley face – just so people don't think this was me being serious for once. … used by pilots to calculate whether the air is dense enough for liftoff. There, and I thought being “dense enough for liftoff” only applied to chopper jockeys! Most of the media are subsitized by governments. Are they going to bite the hand that feeds them? The really really big question here, is what is going on with the mainstream media? In the past this is the sort of thing that totally made journalistic careers. A Pulitzer prize up for grabs! Are they just too lazy? Having climbed so gleefully onto the global warming bandwagon, are they now too embarrassed to get off? Given that the left has embraced global warming as a very convenient stalking horse. Has the mainstream media become so totally infiltrated with left-wing thinking, they just don’t want to know about anything that contradicts the story? In the past the public relied on the free press and investigating journalist to reveal this sort of thing. One thing is for sure without the Internet the general public would never have known about this. Its worth noting that NASA and NOAA are amazing agencies. Until the global temperature “Brewhaha” started, no one really cared. Every one knew forecasts had a 50% chance of being wrong. Also, it isn’t news that the planet is warming and cooling, its been doing that since the last glacial but in cycles for the past 12,000 years. Is the climate establishment that fostered the Cap and Carbon Tax scheme corrupt? That question isn’t had to answer — YES it is. Fortunately for us, only the chumps in the EC are paying the price so far. Did New Zealand recently hop on board the listing Carbon Tax ship? Alan Jones had Ian Plimer on his radio show this morning discussing the backflip by the Royal Society. There are equally (or perhaps more) disturbing aspects relating to the temperature records. 1. The so-called ‘warming’ at many locations is entirely due to largely unexplained ‘adjustments’ to the temperature record, that, curiously, always seem to be in the direction of increasing warming. The NZ temperature record presented by NIWA is currently undergoing scrutiny and not looking too good. There are many other examples. 2. The population of temperature stations used to derive the Mean temperatures has changed, and declined, over the past few years. Again, no explanations, but it seems that the stations dropped have been rural stations (with no delta UHI effects) while the stations retained are problematic urban or airport stations. 3. It appears that adjustments made for delta UHI effects have either not been made at all, or understate the delta UHI effects. This means that increasing UHI effects make a significant warming contribution to the temperature record. 4. Very uneven distribution of temperature stations. Some large areas of the world are sparsely represented, while other parts (the USA for example) have very many stations. It is high time that these other aspects of the temperature record were investigated by journalists and brought to the attention of the public. THE IMPACT OF A CARBON TAX ON AN ECONOMY…. Alan Jones talks to Rodney Hyde – New Zealand MP on the impact of an ETS….. THIS IS THE LAST THING WE WANT IN AUSTRALIA!!! THE THEORY OF MAN MADE GLOBAL WARMING IS A FRAUD!! This is the site for Enviroment Canada’s site in Alert, Ellesmere Island, Nunavut Canada…about 82ish North. It’s minus 22C at the current reporting. The equipment is at the airport. Anyone boating thru the Northwest passage better hurry up. I’ve been waiting and waiting for the sad state of the temperature equipment siting to be seriously addressed by any government agency. I know it ain’t gonna happen. The inmates have taken over the asylum big time. I think it started in the seventies. They are a sad excuse for scientist. Moving slightly to left field, America looks like being spared a Cap & Trade tax with a shift in power after the November elections, several States are Challenging the ETA’s power to introduce damaging cost on Energy and Industry, one Attorney General has tried to bring Mann to account, so America may be safe in the short term. So after a lot of rambling I’ll get to my point,is their anyone out their with legal knowledge, and with the limited and undemocratic make up of said climate committee could it be challenged by a class action as undemocratic. I would certainly be willing to contribute on an ongoing basis, funds are tight but I can spare a little each week. Thx for the superb links. your #3, sometimes the adjustments have even been upwards! Truly brazen. I think your idea of a series of threads like this is a brilliant idea ( especially if readers “on link” them to other sites). I’ve said on another site that I believe that the war will be won by those who are the better communicators and fortunately I think the sceptic side of the debate has by far the better communicators. ( Jo , Anthony Watts , Chris Monkton , Andrew Montford , James Dingpole etc). Each has a different style but each is effective. As much as I would like to see it all settled by the facts and science I don’t think it will — the politicians and MSM are too immersed in it with more than just the science ( eg money !!) for them to change their minds based on scientific facts. We have seen how public opinion can be changed when the theory and how it’s been manipulated is exposed ( ie. climategate etc) so Jo and David’s approach is right in my view. Just keep it very simple. Not just the placement of stations, but cherry-picking by deleting the high latitude, cooler environments and using data from those in the warmer localities. IPCC relies heavily on the surface temperature data, which is distorted by this deletion of a number of surface stations. The ‘best’ stations were kept – the ones around temperature islands and by airports. Phony data in – phony data out. THe German-language EIKE website has a recent article showing the measurable UHI on a traverse through Melbourne, Australia. It’s about 6°C. The graphics are in English so it’s worth a quick look even if your German is limited to ordering Bier and Bratwurst. One could apply a “correction” of course. But one has to know the specific thermodynamic characteristics at each location so as to be able to adjust for it; which isn’t a trivial task, given that those characteristics depend on e.g. winds that change direction and strength throughout the year; and urban “development” itself. NOAA’s “adjustments” have about 0.1% of the necessary rigour. And I’m 90% confident in that. The same could be said about concervation restrictions in Perth urban outskirts. Properties that had no abnormal water capasity to hundreds of acres cirounding them, once estates progress and dewatering on a real wetlands start the water is dumped on a private property usually elderly or immigrant they dont have the will to oppose the very people they trust or voted for, and thier property is rendered useless, mind you they still have to pay rates. Similar situations with bush forever and buffer zones. Global warming and the green movement, is only there to deny prosperity to hard working citizens and remove property rights, for those in the know who will benefit or gain. Even when facts are presented to ministers it is water off a ducks back, because the media nation wide sidestep the issue. Many have gone to an early grave, marriage broke up suicide or depressed and traumatised , good Australian working families, but who gets ministers and media sympathy and attention along with tax funds, those who enter illegally. Logic and commonsence ministers, stop the rot you feed the serfs. Short answer: NO. BOM has links to 2 papers describing homogenisation methods, but both include “subjective decision about whether to adjust and by how much”. Logic?? What’s that? I have yet to receive a response to my questions, just an email saying they don’t take notice of anything not published in a peer reviewed journal. Those thermometers beside black asphalt and central heating in the frozen high latitudes must really exaggerate the warming. Note those big red patches in the polar regions. Plus of course those “hot satellites” for the last decade. The aviation term is: density altitude. Thanks for all your work. If the IPCC dont stick to those BoM rules why should the BoM? According to Donna La Framboise they accept thousands of activist propaganda subs. Is the western climate establishment corrupt? Hmm… Is water wet? Everybody has a price. People who have no other way to earn a living are the easiest to corrupt. Climate scientists work in a specialized field and are therefore easy to buy. The most expensive person to corrupt is someone who has career options and sufficient income and savings to meet his or her needs. An example would be someone who is a corrupt politician with multiple revenue streams that has a trade or profession to fall back on. An example of a trade or profession to fall back on would be railroad engineering. Politicians are amoral and corrupt because politics is a road to hell paved with good intentions. The climate scientists are the mortar and stone used by the politicians to build the aforementioned road. It is sites such as this one that are delaying the construction of the road. Once the politicians realize that their road cannot be constructed of the intended material they will try and find another route or means to complete the road. May our vigilance be eternal! Eddy!!! There you are. HOW ARE YOU??? Ask Jo for my email if you like. Best thing that the Leader of the opposition could do, is organise an open to the public/media investigation committee into the state of climate science,with a weather science blog discussing the various facts arising from the evidence given each day to the Committee. In this way Australians can both hear and see and above all discuss and then assess the truth of climate science, its strength and weaknesses, certainties and uncertainties. The open Committee blog is necessary to combat the almost universal bias of Government financed media and the Institutional educational left wing bias in Australia. An open and searching investigation beats any secret deliberations by a committee formed specifically to approve a costly new taxing system. Makes sense to the Mum’s and Dad’s who will end up paying if this new tax is foisted on us. We have a a right to know, shame on those that concoct political agenda behind closed doors of secret indulgent committees. This is the reason why many people still believe in AGW – because they don’t know there’s been a scandal and they couldn’t care less to self-educate (autodidacticism). Most of what goes through their simple minds every morning is 1,3,7 methyl-xanthine (caffeine). The message (with the evidence) needs to get out. At limited cost to myself, I’ve been printing out, photocopying and handing out flyers with charts and links proving CO2′s not the villain. I’ve been getting mainly negative responses from people – “How have we been lied to for so long?” seems to be the average. Get the message out! Corrupt maybe, but also an incompetent, collegial, group-think dominated bunch of guys who desperately need to make the facts fit a pre-ordained ideological agenda. However, the effects are the same. Bad science resulting in bad policy – unless we decide otherwise. Thank you janama; one of the hardest things about litigation is controlling [sic] the expert testimony which can determine the outcome, or what is known as the ultimate issue, of certain cases. The expert must have recognised expertise or qualifications to a standard outside the experience of ordinary people, and that expertise must be in a recognised area of knowledge; often it becomes PhD’s at 10 paces and the expertise tends to neutralise. To remedy that hurdle any litigation against a nominated pro-AGW propagandist would have to be framed on a straightforward and enclosed complaint. The NZ case for instance is limited to particular adjustments of a particular temperature record; that will be hard enough with obvious defences like the need to make adjustments given the ‘unreliability’ of previous data. But the idea would be to establish an industry standard and then prove that particular AGW component has strayed from the standard. It is time that someone in Australia was taken to legal task for the ramifications of the pro-AGW juggernaut; one obvious ramification would be electricity prices. What puzzles me is why the NOAA’s temperature adjustments are alway up , not down? actually I would reckon the Energy Companies would be hoping someone does take them to court. The Government has imposed the 60c feedback tariff on them. Why should they pay someone 60c/kWh for their measly solar power when they can only charge their customers around 20c plus it makes no difference to their overheads? It’s not as if they turn down their generators because some additional solar power is added to the national grid. Thanks for your concern. I am well. I have been busy moving and filing for divorce. It was my second marriage. You know, the triumph of hope over reason? I’ll check back as often as I can. I miss you, Jo and all the regulars. I thoroughly enjoyed the conference last Friday although I had to leave towards the end of your presentation due to an unseen urgent matter. Thanks to Chris, Dave, Bob, Cory, Alan, Barun (what a character) and yourself there is now a wealth of clear concise information. Now we have to get it out there…a tough ask but not insurmountable. We just need to get more organised. No, they are not corrupt but plainly incompetent on one hand, and under the thrall of rhetoric on the other, Thomas Sowell’s verbal virtuosity to be specific. Corruption is the offering of inducements to government officials in order to achieve particular activities etc which the law otherwise prohibits or limits. Corruption is also to influence politicians to draft or enact laws and regulations to disadvantage your opponents, whatever who they may be, whether political or commericial. I also find it disturbing that many automatically brand incomptence or bias as corruption – when it’s not. Often those who are impure of motive, according to a particular standard, are also demeaned as corrupt. And if the Western Climate establishment are under the thrall of post-modernism then it’s certainly not corruption, not even for a noble cause, but a faith as defined by Brignell as a belief not based on physical evidence. Anything goes in the alternate universe of intellectualism, and to its denizens, it is a place that is said to be holier than holy, and fact that all attest to (passing the peer review, as it were). No the mess that Western Science is, and its not only Climate Science but Astrophysics, geology, archaeology etc, is the expected outcome of sciences that became disconnected from physical reality by the interposing of a rhetorical screen. Has anybody figured out how GISS do their averages when they have supposedly missing data? Their SON of 17.5 is almost a degree too high and the new Esperance annual average for 2009 is 16.87, not 17.1. Similar problem several hundred kilometres inland at Kalgoorlie-Boulder, the gold mining capital of Australia, where September 2009 is 999.9. Which shows a chilly September 2009 average mean temp at 13.9, meaning the Kalgoorlie-Boulder SON works out to be 19.4, not the 20.5 they conjured from the missing September data. So the annual mean for Kalgoorlie-Boulder in 2009 was 19, not 19.28 as calculated by GISS. Chilly September 2009 mean temp once again at 13.9, meaning the Perth Airport SON works out to be 17.2, not the 17.7 calculated by GISS from the missing September data. The annual mean for Perth Airport was 18.75, not 18.88 as calculated by GISS. 13.2, 13.9 and 13.9. Maybe 13 is their unlucky number? Meanwhile, back at the ranch, the Australian BoM suffered a database bug which in November last year saw them upward “correct” all their August 2009 temps in Western Australia by .4 to .5 of a degree at almost all locations. For example, Esperance August 2009 av mean min up from 8.3 to 8.8, max from 17.7 to 18.1; Kalgoorlie-Boulder August 2009 min up from 6.8 to 7.2, max from 20.3 to 20.7; and Perth (metro, not airport) min up from 8.8 to 9.3, max from 18.5 to 18.9. The GISS data for Esperance and Kalgoorlie-Boulder in August 2009 is the BoM database bug corrected data. August 2009 was the hottest ever August recorded in Australia. I’m sure it all makes sense to statisticians but I’m off to the casino where I can rely on the numbers. PS: Readers of the above data re Kalgoorlie-Boulder might be saying no, I’ve got the figures wrong! Your data isn’t the same as on the GISS page! Which means their DJF changed from 25.8 to 25.9, their MAM from 18.6 to 18.7, their JJA from 12.2 to 12.3 and their mystery SON from 20.5 to 20.6, meaning the annual average mean temp in Kalgoorlie-Boulder in 2009 shifted from 19.28 to 19.38. Maybe by adding .1 degree once in a while and doing it within just 14 hours, they are proving the climate is changing so rapidly the temperature goes up 10 months after it’s actually happened! The roulette wheel is looking increasingly reliable compared to BoM and GISS data which changes shape even as you’re researching it. Not only Bob Carter, but also Ian Plimer. God, I despise Robin Williams! This is WA’s biggest rural newspaper, in the Rural Press stable that has newpapers in every state in Australia. If you go to the link above & read the article in full, you will see that you can add comments. … until the Fat Lady Sings <– Post Now! Oh Eddy, my thoughts are with you. Well, come join the batchelors club. I can tell you a few positives from a “blokey” point of view. * You can scratch your….. The International Accounting Standards Board (IASB), the agency which sets international accounting standards, has issued a proposed amendment to the International Financial Reporting Standards to deal with the effects of “severe hyperinflation.” According to an “exposure draft” issued Sept. 30, the IASB wants “an exemption that would allow an entity to measure assets and liabilities at fair value and use that fair value as the deemed cost of those assets and liabilities” in their financial statements. The IASB is based in London, and is chaired by one of the British Crown’s knights, Sir David Tweedie. A more apt name for this body would be the Imperial Accounting Standards Board, as its role is to impose rules which benefit the Brutish Empire’s monetary system, at the expense of the nations and the peoples of the world. IASB standards, imposed by the empire, form the basis for the national accounting standards of many nations. The IASB has formally requested comments from accountants and other interested parties on this proposed amendment, with a deadline of Nov. 30. It seems they know something they do not want to admit to the public at large, namely that “severe hyperinflation” is a reality with which the accountants will have to deal. It is yet another de facto admission from the empire that Lyndon LaRouche is right about the hyperinflationary blowout, while at the same time pretending that it can be dealt with by accounting measures. Gee guys: One minute your system is there, the next minute it is gone. How are you gonna account for that? business editor for the Telegraph in London, who has lately issued similar warnings. See http://blogs.telegraph.co.uk/finance/author/ambroseevans-pritchard/ and scroll down to Shut down the fed ( part 2 ). by Richard S. Lindzen (a leading climate scientist). and it details how climate science has become corrupted. Indeed, it names those most responsible for the corruption and how they did it. People are being employed, funded and paid based on their cliamed competence in a particular field. They are taking the money and requesting funding for further work. They are producing reports that have conclusions which aren’t supported without cooking data; or making up the data completely (i.e. models). Those people are being encouraged byothers to continue work like that. In (private) enterprise, those things would count as fraud and conspiracy to commit fraud. But I’m not a lawyer. Maybe it takes special legal training to be blind to the crime. Of course, this manipulation has been suspected for years, but has since been exposed. Following “climategate”, many started to closely scrutinize the climate data only to find the extent of the global warming corruption. No government dares do anything about this fraud for obvious reasons… just as they did not dare say “Boo” against Al Gore’s lies and gross exaggerations in “An Inconvenient Truth”. They all want global warming to continue for the purpose of regulating/taxing “carbon”…. but fortunately, Mother Nature is not listening to today’s new ‘snake-oil salesmen’ … the man-made global warming alarmists! My thoughts run to the proposition that given even the mighty Phil Jones has said there has been no significant warming for a decade or so. With all this extra thermometer heat and the fudges just how cold is it getting? I am suggesting at least one degree in the last decade and maybe more. This I feel negates any person caused global warming. Perhaps it is time to horde used tyres and we can have a day like earth hour, whereby we all have bon fires to assist in warming the planet. The real carbon black would alas only result in more cooling. Perhaps the odd sacrifice to the sun god maybe more propitious, and awaken his rather untimely slumber. So much for the tax payer funded agencies and their useful idiot followers who have tried to push a political agenda using science. They have proved to be social scientists with no facts and an agenda of propaganda. They poor souls are in the position of slowly running out of other peoples money as the economies and the people are slowly awakening to the harsh truth of reality.A scam by any other name is still a scam. The twentieth century in science was wasted by consensus and exclusion in many fields, one can hope that this century the nexus is broken and free thought and new ideas are welcomed, it would be novel. Check out the 11 Comments made to the ABC “Science” Show following Ward’s criticism of Bob Carter! Auntie must get the message soon. When knocking the alarmism becomes fashionable the journos. will not be able to get enough of these stories, and will all be claiming credit for having exposed it first. The time will come and the 10:10 debacle has probably knocked things a lot further in that direction. It will be interesting to see how general the technique is. I was able to do the same thing with UK station data using the local AMO as reference. It also shows how the global warming fraud was created. There is no CO2 ‘signature’ in the station record. The climate models are just ‘hard wired’ with the hockey stick using the radiative forcing constants. They will never get the message because they don’t want to hear it. I just turned on the Teev and flicked through the channels. On the ABC news channel some “expert” admitted that solar power could never compete with “fossil” fuelled power in the absence of a “carbon” tax. Will that change their mantra? Not bloody likely! Worse than lemmings they are. I think you’re right, I’m following a similar approach and I think SST and wind direction could be major factors. Early days yet. Someone is confused about basics. The obliquity, or inclination, of the Earth’s spin axis has NOT been increasing, and only recently started to decrease. It has been decreasing for at least the last 2500 years, and shows no signs of slowing down and reversing course. The rate of decrease is a constant 0.00013º per year. More generally, the Milankovitch theory is as incompetent as the “greenhouse effect” theory. Look up the work, for example, of Carl Wunsch of MIT, and R.A. Muller of UCal Berkeley on this subject. Which brings us right back to the “greenhouse effect”. It is garbage, and even Curry, Monckton, Lindzen, Spencer etc. are wrong on that. Monckton is pleased that the tropospheric “hot spot” predicted by that theory is completely missing, yet he still doesn’t understand the implication: It is not missing because it is too small to measure, it is missing because the effect doesn’t exist. The incompetence is deeper than Curry et al. realize, and their stand is part of it. The temperature lapse rate of the atmosphere is -g/c, with g = accel. due to gravity and c = specific heat of the atmosphere. It is completely independent of the presence of IR absorption in the atmosphere. What believers in the GE don’t, or won’t, understand is that the IR radiation absorbed and emitted by co2 and other gases is just heat energy, and it cannot either warm or slow down heat transport in the atmosphere. Heat energy takes the most efficient path available to it to get to the same final temperature distribution (as exhibited by the observed lapse rate), so adding co2 can only increase the efficiency of heat transport, by providing that additional pathway for the heat to go. Obviously, the scientific incompetence on this point is deeply entrenched, and the “greenhouse gas” hypothesis is an unquestioned dogma to a whole generation of earth (not just climate) scientists. What is really surprising is that so many who identify themselves as physicists have been taken in. Nevertheless, you will find physicists such as Gerlich and Tscheuschner, Tom Vonk, and Claes Johnson strongly aware that it is nonsense, and speaking out on it. I’ve always felt that GE was crap simply because there is no “roof” on the planet. Overly simplistic? Certainly, and I know some of the regulars here will disagree with me. But is GE rationale overly abstruse? Even more certainly, and I’m not prepared to bet my family’s future prosperity on it, either.